and produced by Tom Price. Below are the selections that feature Dash Crofts. 01. Hummingbird. Performed by Dash Crofts and Paul Seaforth. 02. East of Ginger Trees. Performed by Dash Crofts and Dan Seals. 03. We May Never Pass This Way (Again). Performed by Dash Crofts and Paul Seaforth. 04. Windflowers. Performed by Dash Crofts and Dan Seals. 05. One Planet, One People, Please. Performed by Dash Crofts. 06. Advance Guards. Performed by Dash Crofts and Paul Seaforth. 07. Blessed Is the Spot. Performed by Dash Crofts. 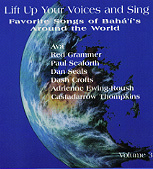 From the album LIFT UP YOUR VOICES AND SING, VOL. 3 (1980). Where mention of God hath been made, and his praise glorified.